One of the reasons why I enjoy living in Brighton is the traditional August Bank Holiday vibe. Particularly when it comes to photography. And this Bank Holiday was no exception; everyone enjoyed the hot sunshine, and the usual bank holiday sense of freedom from the day job. And of course, there were scooters. I used to have a scooter, a Lambretta Li 150 Series II to be precise, so it’s inevitable I’d be drawn to the Mod invasion, and love seeing what enthusiastic scooter owners have done with their rides. Throughout Friday you could hear the two-stroke engines puttering by, and by Saturday, Brighton had its fair share of Lambrettas and Vespas. I guess it’s part of my nature, avoiding photographing people, and focusing (no pun intended) on the abstract; capturing the decals, arrangement of lights and mirrors, the professional paintwork and artistry. There’s just something about going up to someone and asking them for their portrait that makes me nervous inside, and I realise I need to get over that. Perhaps that will be the intention behind a future photowalk. Yeah. Let’s put that off until the future … let’s just take photos of machinery until then, because machines don’t talk back, do they? It’s amazing how many scooter groups from all around the country take part in the pilgrimage to Brighton. The scooters, most of them much older than my kids, manage to make their way, most without mechanical mishap. Though there was one guy who had obviously had engine trouble. He was stripping his engine on the promenade and commented to me, as I took a photo of the parts strewn about, that his engine had never had so many photos taken of it. Well, there’s a fascination of what’s behind the mask, isn’t there? Most of us are curious to know what’s going on behind the scenes, the great Wizard pulling the strings, the explanation behind the magician’s effect. And with tribes that are so alien to us, displaying their finery like the bedazzling peacock, we are inquisitive enough to gawp and stare, point and cajole, some with a sense of envy, always being on the outside and wishing to be one of the chosen ones. And so what was simply a walk on the promenade in the baking sun, with our ice cream cone dripping over sticky fingers, soon turns into a trip to the zoo, a travel back in time, a monophonic musical journey with tinny thrashing guitars or conversely a spectral wall of sound. Because being a Mod is not just about owning a scooter, or listening to Stax and Motown, or wearing your parka in the blazing heat; it’s not about dancing all night, popped out your head; it’s not about being the Face in a sea of faces. 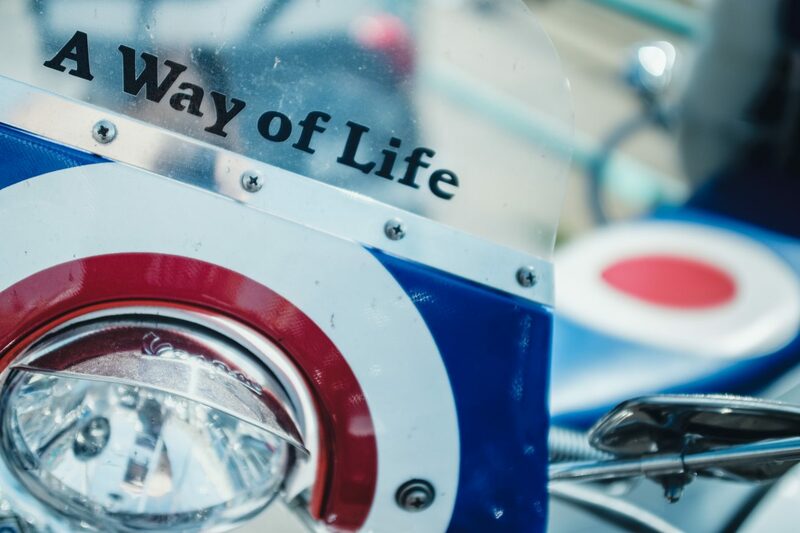 It’s a whole way of life. Then I realised, once a Mod, always a Mod. And that’s not me, not the way I dress, not the way I stand, not the way I think. Yeah, I still love the music; yes, I still dig the fashion; but somehow I can’t describe myself as a Mod any more.